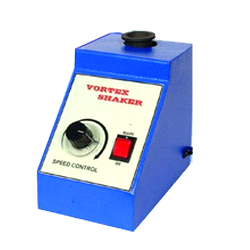 We are offering Vortex Shaker. Keeping in mind the vast necessities of the patrons, we are engaged in providing a wide range of Vortex Shaker. 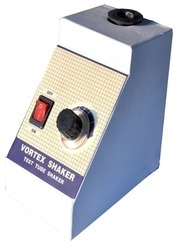 Vortex Shaker ( Test Tube Shaker) is useful for Stirring Centrifugal Tubes, Test Tubes or small flasks. Glass Agencies EROSE are manufacturer of Vortex shaker. We are offering Vortex Shaker to our clients. Vortex Shakers are useful process machines that find application in achieving accelerated mixing of solutions in small flasks, centrifugal tubes and test tubes. With the operating speed regulated through speed control device, these are simple devices that can be seen in use in laboratories like that if bioscience for mixing small vials of liquid. It is useful for rapidly mixing/agitating solution in test tubes. The vibrating neoprene rubber cup accommodates a variety of sizes of test tube/flasks. - Useful for accelerated mixing of solutions in test tubes, small flasks or centrifugal tubes etc. - The housing is 150x150 mm. - The speed is regulated by a speed control device. - Short eccentric stroke motor imparts vigorous agitation to the tubes or flasks. - Body is strong and finished in stoving enamel paint.